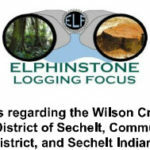 Letter to Decision-Makers regarding the Wilson Creek Watershed Logging Controversy, including: District of Sechelt, Community Forest Board, Sunshine Coast Forest District, and Sechelt Indian Band. In the Coast Reporter’s Nov. 3rd editorial, ‘Paths of Rational Resistance’ its author Mr. Gleeson was referring to news that the Sunshine Coast Community Forest (SCCF) was set to resume logging in the contentious Wilson Creek Watershed. His plea was to find a rational solution to a pending crisis where no one wins. If an editorial represents the ‘conscience of the community’, then his words and suggestions should be thoughtfully considered. ELF agrees that a solution must be found to create a shared path. This however requires compromise. Below are the objectives, and then a means on how to get there. Rational forestry planning calls for following provincial higher-level directives. In 2004, the provincial government issued an ‘order’ calling on Forest Districts and Ministry of Environment biologists to cooperate in mapping winter ranges for a variety of large mammals, including Elk. Elk are blue-listed species on the endangered list, and they require specific forest conditions to shelter in during severe winter conditions to maintain thermal balance or else a population can die off which has been documented. Vancouver Island and the Kootenays Districts followed the order and established what are called Elk Ungulate Winter Ranges (UWR). For the past 13 years the Sunshine Coast Forest District HAS NOT cooperated with local Ministry biologists to undertake this task resulting in potential Elk range being lost to logging. A rational planning approach would dictate that the Forest District not approve further cutblocks until Elk winter ranges are mapped. Professional foresters are held to a standard to follow legal and ethical requirements when performing their jobs. The ethical thing to do at this time, considering lack of Elk UWRs, and all of the forest cover loss in the Wilson Creek Watershed, is to respect the precautionary principle until all evidence is gathered and presented.. To that end, the proper, and professional path is to defer Blk EW28 until MOE biologists can conduct field studies and present an landscape level UWR package. The province will then be able to consider the mapped UWRs, and finally approve areas giving certainty to obtaining a sustainable Elk population. . When the public sees its civil servants, elected officials, and industry professionals proceeding in a step-by-step rational approach to land planning then social license is attained. SCCF is proposing 3 cutblocks in this recent tender to logging contractors: EW28, EW23, and HM49 comprising 34,500 m3 of timber. The EW28 blk – also known as The Chanterelle Forest, was subject to a field study by McCrory Wildlife Services examining Elk habitat. The science showed medium to high usage, and concluded that the forest was a part of a distributed Elk range between Rainy and Gray Creek Valleys. The ‘Chanterelle Forest’ is a westerly component of the Sunshine Coast Regional District’s expanded Mt. Elphinstone Park (OCP Bylaw 641), and is under review by the new provincial government. A ‘ Conservation Review of an expanded Mt. Elphinstone Provincial Park’ shows it to have high biodiversity values. ELF’s objective is find the highest and best use of this forest, and to support our Regional District. Our position is that evidence based decision-making will prove beyond a doubt that logging of EW28 should be canceled, and the forest included in UWR planning and part of a new protected area. We have little knowledge of the 2 other blocks in the SCCF’s tender package, thus can’t comment on them, and have no opinion requiring them. We firmly believe that the above points meets the spirit of the Coast Reporter’s Editorial to find a rational response to this issue, while being environmentally and economically responsible. We request that decision-makers come together, support it, and end up with a plan that the wider community can live with and be proud of.